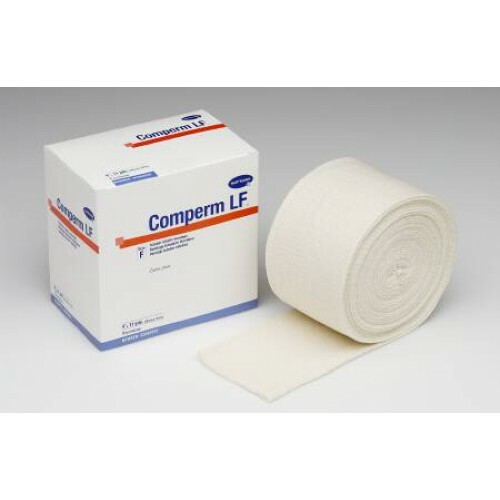 Comperm, manufactured by Hartmann-USA, is a tubular bandage that maximizes support while minimizing constriction. This product provides uniform compression and support all around the limb while minimizing constriction. This is done without the typical bandage wrapping involving pins or clips. Many individuals who have used elastic bandages have experienced the issue of losing the pins or clips rendering their bandage less convenient. Not the case with the Comperm Tubular Bandage since there are no pins or clips to lose. This dressing is applied simply by stretching the tubular bandage over the affected limb. This product features ravel-free and run-free cut-ability. Tubular dressings usually need to be cut to the desired length so they can fit correctly. This feature helps with keeping the dressing from unraveling and running. This product is manufactured with 100 percent seamless cotton that is easy to apply, comfortable to wear, and stays in place for a number of applications. This tubular bandage is so durable that compression and support stay consistent even after re-application. Secure wound dressings with this unique effective tubular bandage. 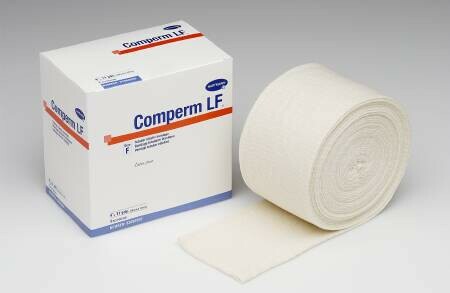 BUY Comperm from Vitality Medical today. 360 degree compression and support. Secures wound dressings without clips or pins. Easily cut with ravel-free and run-free design. Compression and support stay consistent even after re-application. Great for securing zinc-oxide paste bandages.